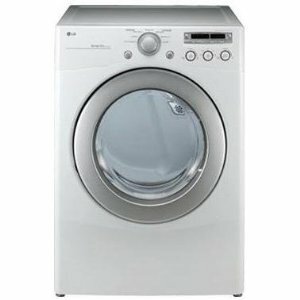 The LG DLE2050W is a compact and practical dryer that may be best recommended to starter homes. The capacity is still large enough to accommodate an average household’s laundry but the dryer only comes with 7 drying programs that may not be able to provide care for some types of fabric. The Sensor Dry technology detects the amount of temperature and the length of drying time needed to remove all moisture from the garments. 7 drying programs will sound tame compared to what some dryers can offer. However, for some households, these programs may suffice. There are already basic programs such as cycles designed for delicates and for cotton. Normal and refresh settings are also available. However, there are no sanitize, bulky and active wear programs. There is a Wrinkle Care cycle that still provides this starter dryer with a means to reduce creases in the garments. So, those who may not have a lot of time to allot into their ironing will be happy with this cycle/feature. The LoDecibel Quiet System makes time at the laundry room pleasant. There would be no wild ruckus ensuing whenever there is a heavy load. Quiet operation should be able to reduce the stress of doing household chores. The Sensor Dry System ensures that each load will be getting the right drying time and drying temperature. The LG DLE2050W model is able to measure the amount of moisture found in the drum. After having measured said moisture, it can adjust the temperature and drying time to best get rid of that moisture. The LG DLE2050W is only available in white. This traditional exterior color should not be a problem as it can blend into most households. The color also provides a clean and hygienic look, which is appropriate to the applianceís function. The dryer comes with an LED display in a user-friendly control panel. The effect is both utilitarian and stylish. There is a dial used for choosing cycles. This may seem old-fashioned but presents an easy way to select a cycle. The center of the door is made of glass with a silver rim. The door is reversible. So, it is easy for the user to maneuver the door even in the tightest places. As with most if not all LG dryers, the LG DLE2050W is stackable with a compatible washer. This makes it easy to fit into just about any laundry area. The LG DLE2050W presents quiet operation. The household will not be bothered by an unpleasant noise while the user is performing his laundry duties. The stackable feature makes this dryer a perfect space saver. The dryer is easy to use with the help of a stylish and modern-looking control panel. The LG DLE2050W is not Energy Star certified. So, the consumer must find other means to save energy. There are only 7 drying programs available. This means that the consumer may not be able to achieve the desired results for bulky garments.